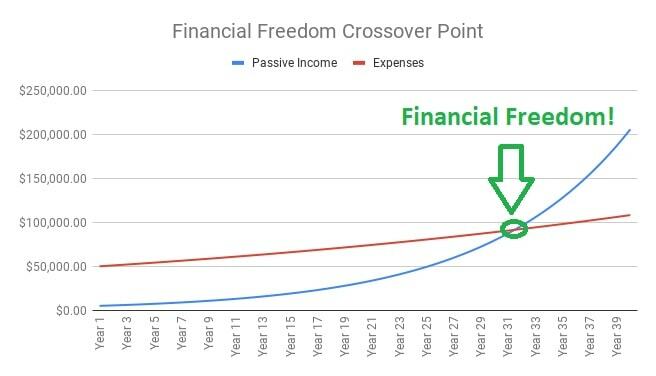 In my last financial freedom update, I briefly mentioned the concept of the crossover point. It’s a fairly simple, but motivating, concept that shows the point at which your passive income grows enough to meet (or just about exceed) your recurring monthly/annual expenses. In essence, it’s the point where you reach financial independence or FIRE (financial independence/retire early). As an example, check out the image at the top of this post. The blue line represents growing passive income, while the red line represents annual expenses. For this hypothetical example, I assumed that the family was fairly frugal with $50k in annual expenses increasing with inflation annually. In year 1, this family generated $5k in passive income with the goal of compounding the income by 10% per year. Assuming a perfect track record, the passive income produced will result in a crossover point at around the 32-year mark. As with any compound interest, the chart is slow to grow in the beginning, but a couple of decades in and the portfolio will really start to take off. When shooting for financial freedom, the goal is to continually grow your passive income sources while keeping your expenses in check. In my case, I’ve chosen to accumulate publicly traded companies that have a history of growing their dividend. The beauty of this strategy is that these companies, for the most part, pay a predictable dividend with a fairly predictable increase on an annual basis. Not only do you get a regularly occurring raise in your sleep, the extra money helps combat the erosive impact of inflation. The icing on the cake is that eligible dividends get preferential tax treatment for early retirees. For example, in most provinces, you can earn up to $40k from eligible dividend income and pay little or no income tax (providing that you have no other reported income) and double if you can split the dividend income with your spouse. As stated in my last financial freedom update, we are up to $48k in dividend income. With fairly consistent annual expenses in the $52-$54k range, we are getting close to the crossover point (ie. financial independence). While I don’t plan on retiring quite this early (I’m still 25 in my mind), it’s a reassuring financial backup plan if something were to happen that impacted our main income stream (ie. losing my job, poor health etc). It’s like being self-insured against financial risk. As a believer of not killing the golden goose, my strategy of only spending the dividends has a downside – it requires a large portfolio. For example, going for $40k in dividend income, assuming 4% yield, would require a $1M portfolio; $60k in dividend income requires a $1.5M portfolio; and $100k in dividend income would require a $2.5M portfolio. While a multi-million dollar portfolio may seem out of reach for some, you likely won’t need that much capital for a comfortable retirement. Especially if you are getting close to retirement age! Choosing a regular retirement in the 60-65 age range puts much less strain on your personal finances. Why? Because of government senior programs. The average senior benefits payout for a couple (age 65) that has lived and worked in Canada all of their lives is about $30,000. That’s $30,000 before dipping into any of your investment accounts like your RRSP, TFSA etc. If you spend your money efficiently like the family above and average $50k in spending a year, that would leave you with a $20k income gap. This could be made up with income sources such as a defined benefit pension, building your own pension with an annuity (approx $330k for a $20k/year benefit), part-time work, and your investment accounts. If depending on your investment accounts, you would require approximately $500k to generate $20k/year for 30 years based on the 4% rule. If you are young and interested in personal finance and investing, FIRE is achievable with some strategy and focus. If that is your goal, then a good measuring stick is to chart out and follow your crossover point. The more aggressive your savings and the lower you keep your annual expenses, the faster you will achieve FIRE. For example, if you can save 50% of your take-home pay, you will reach FI in about 16 years. If can bump that savings rate up to 65% (pretty extreme if you ask me), then 10 years should do the trick. See this article for more detail. On another note, if you dream about early retirement because you dislike your current job, then I think that refocusing your career into something that you may enjoy is a better strategy – even if it pays less! After all, even if you reach FI, retiring “to” something is the real goal rather than retiring “from” something you didn’t enjoy. I’m always extremely impressed with how much you and your family have been able to save, and that you’re so close to your crossover point. It’s especially impressive that you’re aiming to use only (or mostly) dividend income for your retirement spending! Wow, that’s some hard work there, and excellent planning. Nice work FT! Thanks for the kind feedback Chrissy! Hope all is well with you and yours . Thanks for sharing your expenses/ investment income graph. You have done a great job at avoiding living expense inflation! Keep it up! I look forward to reading about your inflection point. Thanks for stopping by Laura ! Very informative article! I noticed that the first chart assumes expenses double in about 36 years (from 50K to 100K, year 1 to year 36). Is this optimistic or conservative for major househood expenses? Should we assume we use dividends cover inflation (as you mentioned in the retire early articles), or can we rely on dividend increases to cover inflation? I used 2% inflation number, you could increase to 3% to be more conservative. For me, I like to assume that dividend growth will more than cover inflation. You are getting so close to your crossing point and you are still so young. Very impressive. I thought to be safe, the crossing point needs to be higher than the recurring expense? Let’s say you might not have extended health insurance and now you need to pay dental and visual care from your own pocket. Also maybe some of the income is from RRSP and tax needs to be paid on that. May, yes you can build in a contingency. For us, the goal is 60k in dividend income even though our expenses are in the 52 to 54k range . So we have the same mindset as you in using a contingency. FT, I have a question, maybe a dumb one. You invest in dividend shares, but don’t your ETF’s also pay you dividends or distributions every year? Why not just invest more in your ETF portfolio to get passive income from that investment? It seems less risky than dividend investing, which is just stock-picking when all is said and done – exactly the opposite of the ETF, passive investing, couch potato strategy you used to get to your million dolllar net worth! ? Hey Chris ! Ask away no such thing as a dumb question. I’ve been a dividend investor since I started the Smith manoeuvre in 2008. I use dividend stocks for my Canadian exposure, and ETFs for international. I will admit that I have us dividend stocks in my RRSP but in hindsight I probably would have done just as well with a us ETF . Last little while I’ve been adding xaw to my RRSP. However one of the reasons for dividends investing is to achieve financial independence at a relatively young age through passive income . The biggest risk of retiring young is longevity. The portfolio will need to last a long time and the 4% rule theoretically only lasts 30 years . So for me , building a dividend portfolio and only spending the capital during retirement solves this problem . Ahh so close to the FI point, how exciting! Congratulations. I would think a person with a million dollar portfolio would have been financially free long before that crossing point. How can a risk-free annuity of $330K pay $20k p.a. (and be profitable for the issuer) when the 4% rule (cap exhausted in 30 yrs) applied to $500k also pays $20k? Remember that with an annuity, you exchange your capital for the monthly cash flow. So if you pass away 5 years after purchasing the annuity, your capital remains with the insurance company and not passed onto your estate (unless you have a guaranteed payment rider which would reduce your benefit). How exciting as you approach crossover point. Semi-retired from teaching in June 2018. The more blogs I read the more grateful I am for my teachers pension. I will be sending my kids a link to your amazing site. Thanks for all the great articles. Your blog and a few others, should be mandatory reading in Canadian classrooms. Pensions are a great safety net and thanks for the kind feedback. Is there a reason that ‘after tax’ passive income isn’t used to figure out the crossover point. Generally (not always) its after-tax money that is used to pay for expenses. I realize many forms of passive income have a natural tax advantage (ie. dividends tax treatment or capital gains) but the tax man never goes away. I have a similar concern that sometimes banks and mortgage brokers calculate how much house people can afford using gross income. That’s a good point and my cross-over point requires after tax income! Having said that, assuming that you retire young, your tax bracket would be very low. For us, since we are using mostly dividends, the only taxation is if we withdraw from our RRSP. And even then, we can withdraw up to the basic amount without paying any tax. This low taxation is amplified if you have a spouse to retire with! Next post: Maxed out RRSP and TFSA – Now What? 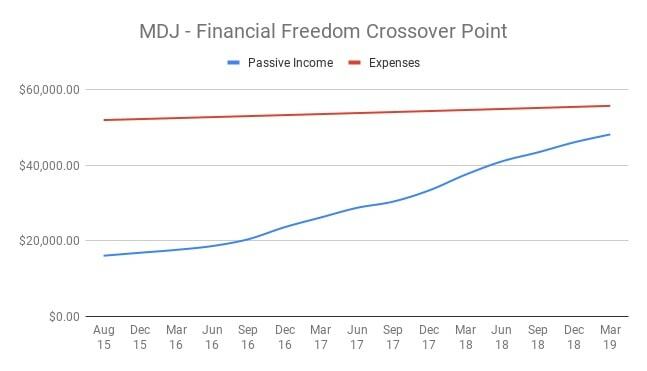 Previous post: Financial Freedom Update (Q1) – March 2019 ($48,200 in Dividend Income)!